Improvements to the Meadowlands’ unique urban ecosystem are supported by the work of the Natural Resources Management Department. The Department conducts surveys on area wildlife and looks for ways to enhance and preserve the environment by protecting wetlands and native plants and animals, and by finding ways to eliminate or reduce invasive flora and nuisance fauna. The research performed by the Natural Resources Management Department furthers the NJSEA’s ongoing commitment to exploring ways to improve and protect vital natural resources in the Meadowlands District. 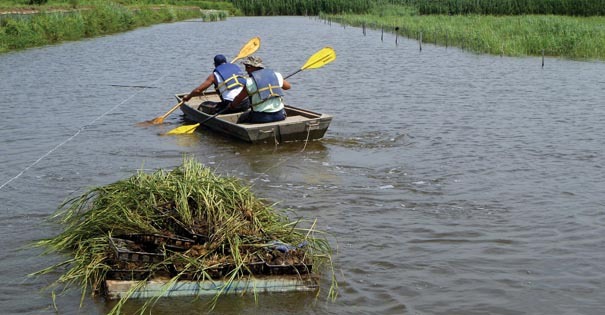 • Natural Resources supports the US Army Corps of Engineers by providing local sponsorship to the Corps’ Hudson-Raritan Estuary Ecosystem Restoration Feasibility Study. • Natural Resources staff serve on the US Army Corps of Engineers’ Interagency Review Team, which advises the Corps on wetland mitigation. • Natural Resources assisted the New Jersey Department of Environmental Protection in the development of a Wildlife Action Plan for the Meadowlands. • Meadowlands Conservation Trust receives technical support from Natural Resources. Natural Resources also collaborates on studies with faculty and students from various academic institutions. The Department has participated in cooperative projects of common interest with non-governmental organizations including the New Jersey Audubon Society, New York City Audubon Society, Bergen County Audubon Society, Ducks Unlimited and the Wetlands Institute. One of the NJSEA’s goals is to protect wetlands. Wetlands protection in turn benefits Meadowlands District residents by reducing storm water runoff and flooding and providing passive recreation space. Wetlands are lands that are flooded or saturated at or near the ground surface for varying periods of time during the year. Wetlands generally are found between uplands and deep water. Based on their characteristics wetlands are further referred to as marshes, swamps, bogs and wet meadows. Wetlands provide habitats and breeding grounds for many species of animals and vegetation, filter pollutants and temporarily hold rainwater and runoff, which reduces flooding and soil erosion. Most of the wetlands in the Meadowlands District are brackish and tidally inundated. Wetlands and open waters receive particular attention because of federal and state regulations pertaining to the federal Clean Water Act. Prior to occupation by European immigrants, the Meadowlands contained more than 21,000 acres of undeveloped wildlife habitat, most of which were wetlands, including approximately 18,600 acres that were estuarine tidal and about 1,500 freshwater. At one time people perceived no direct need for wetlands in the Meadowlands. Early settlers and 19th century residents sought to fill in the swamps and dike the creeks to make the land suitable to their purposes. This began the process of wetland loss and degradation. Today, more than 8,400 acres of wetlands remain in the District. The enhancement of drained or altered wetlands re-establishes and adds important ecological functions to the landscape, including the restoration of degraded wildlife habitat, increased flood storage and improved water quality. One of the NJSEA’s goals is to preserve or enhance the more than 8,400 acres of wetlands and open water in the Meadowlands District. The Authority to date has acquired or holds management rights to more than 2,500 acres of wetlands for preservation. About another 1,400 acres that are not owned by the NJSEA have also been preserved. 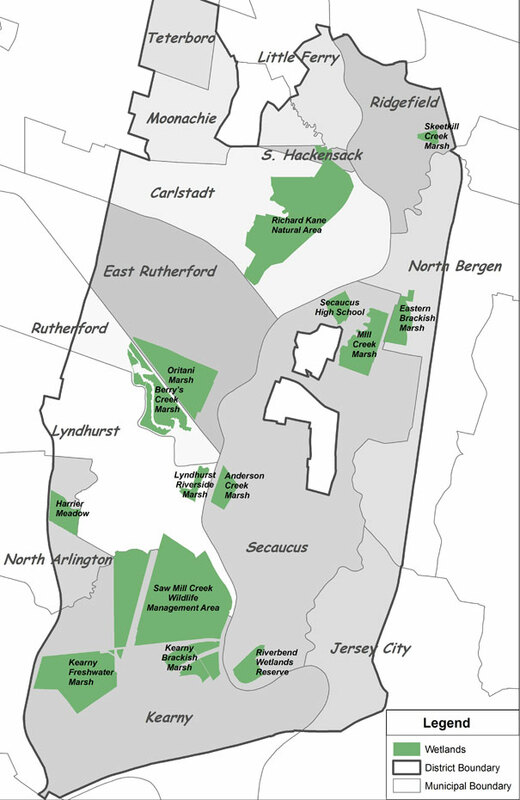 These include 587 acres at the Richard P. Kane Natural Area in Carlstadt and South Hackensack, a property owned by the Meadowlands Conservation Trust, and 257 acres of enhanced wetlands in Carlstadt owned by Marsh Resources Incorporated. The intent of wetlands enhancement is not to restore the site to the conditions of a particular time in the past. Rather, enhancement usually involves improving the site’s ecological value This is often accomplished by increasing tidal flow by removing past fill and otherwise modifying the topography; removing invasive plant species; planting desirable native vegetation; and following enhancement management practices for invasive species and nuisance wildlife. Under these improved hydrological and vegetative conditions, a greater diversity of wildlife utilizes the sites. The Authority’s preservation and enhancement of wetlands within the Meadowlands District is an important initiative that improves the environment and the quality of life for humans and wildlife.